Based on reviews from 784,937 users. Learn how our rankings work or see our guide to blue sneakers. Updated Apr 2019. In sneakerdom, generally the more vibrant a sneaker is and the more eye-catching the colorway, the more successful it is. Of course, you have to take design into consideration, but some of the most notable kicks in sneaker history were defined by their hues. And what could be more versatile and universally appealing than the color blue? The blue shade can run neutral just like everyone’s ubiquitous denim jeans, or be as brilliant and striking as a metallic hue. In this guide to blue sneakers, we’ve compiled some of the most popular shoes in history in that particular colorway, and we’ve thrown in some style tips as well. Some shades of the color blue are so associated with a particular brand’s shoe that they’re hard to imagine being used by another, while some footwear have used a blue hue in such a notable way that they’ve become iconic. Here are some quite notable shades of blue that need not much prompting about the brand that launched them. Steel Blue - The Steel Blue hue has often been used by New Balance across several of their models, but the model that first debuted this colorway is the NB 1300. These heritage shoes debuted in 1985 at a whopping price of $130. 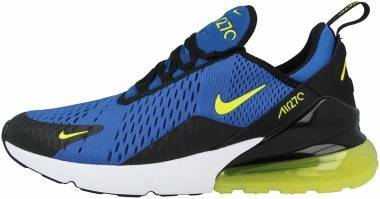 The running shoes had molded soles and featured the brand’s ENCAP technology which gave them stability and a smooth ride. Tiffany Blue - The Nike Dunk Low Pro SB “Tiffany” shoes are one of the most sought-after SBs ever with only 4,000 pairs made and released in 2005. Created in collaboration with Diamond Supply Co., the blue sneakers were inspired by the jewelry boxes of Tiffany & Co. and had that sophisticated aura you would associate with an upscale jewelry company. Hits of soft Tiffany blue leather can be seen on the lateral and medial sides as well as the toebox while a black alligator-patterned material covered most of the upper. Royal Blue - This shade has been around for centuries ever since millers created it, specifically for Queen Charlotte of the UK. Nike was the first to elevate this shade to dope levels in their 1997 release of the Nike Air Foamposite One “Royal” which featured carbon fiber, Zoom Air, and liquid Foam mold. The hue has since then become a standard color in nearly every other brand’s lineup. Sapphire Blue - The Puma Suede sneakers are one of the most iconic shoes of all time, debuting in 1968 as a track and field footwear. The original colorway was a rich sapphire blue. As beautiful as the kicks were, it was Tommie Smith that elevated their popularity further when he ran in his Suedes and won the 200-meter gold. The popularity was also tinged with history when Smith took them off after he ascended the podium and gave his famous Black Power salute. Gazelle Blue - The Adidas Gazelle, which debuted in 1966, was the first shoe of the brand to be covered in suede specifically kangaroo velour. The Gazelle Blue version was extremely lightweight and featured gripping microcell ripple soles which gave the footwear more impact protection and good traction on indoor surfaces. These blue shoes became even more significant when legendary swimmer Mark Spitz carried a pair to the victory stand (and was famously fined for doing so) because he thought his pants were too baggy to show off the shoes properly. The color blue is a timeless shade that has made its indelible mark in sneaker history. Here are a few famous blue-hued models from your beloved sneaker brands. Adidas Raleigh 9tis Mid - These basketball-inspired mid-top sneakers are a mish-mash of several models, namely the Centennial and Decade silhouettes with a little DNA from the Conductor and the Rivalry thrown in. The uppers’ mix of suede and leather fabrics look especially cool in navy, particularly when matched with dark wash jeans. Adidas NMD_CS2 Primeknit - An updated version of the celebrated NMD_CS1, the CS2 Primeknit are modern slip-on streetwear sneakers that feature minimalist styling and ultra comfort via Boost cushioning. The Ronin Pack release for this silhouette featuring two colorways in collegiate navy is especially sought-after. Adidas Hamburg - As an Adidas Original silhouette, these blue shoes were originally released in the 80s as part of the brand’s Global City series. They were designed as indoor training shoes and are memorable due to their grooved side panels and T-toe design. The Adidas Originals Hamburg are available in a variety of colorways including two blue hues, namely Collegiate Navy and Bluebird Blue. Adidas 350 - These blue sneakers first found their way on the scene in the 80s as exclusive Japanese releases and were revived in 2016 as part of the brand’s Spezial line. Notable for their sleek and sporty appeal, the versatile leather footwear can be worn through all seasons and with most outfits due to their neutral colorways which include several shades of blue. Adidas Cloudfoam Revival Mid - These comfort-defined blue sneakers feature the lightweight but solid Cloudfoam cushioning system. Combined with woven mesh uppers and camouflage heel patterns, the shoes are a solid mix of comfort and modern style. Puma Ignite Limitless - The street-ready Ignite Limitless are technologically-advanced sneakers that are a creative fusion of style and performance. 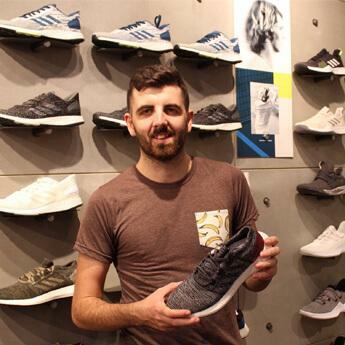 They feature a clam-shell construction, Ignite Foam midsoles for superior cushioning, and four-way stretch Ariaprene material for better ventilation. Puma Suede Classic Mono Iced - These blue shoes are a monochromatic version of an iconic silhouette, the Suede. Many features of the classic remain—characteristics that made it a favorite in yesterday’s hip-hop culture—although the suede uppers are now dressed head-to-toe in one hue, and the rubber outsoles have been given an icy and semi-translucent semblance. Puma Fierce Velvet VR - Riveting and sleek is what the Puma Fierce Velvet VR is all about. 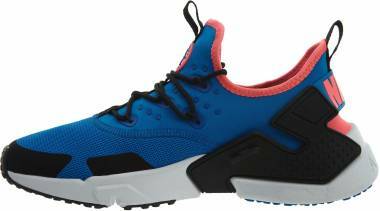 These blue sneakers feature a support synthetic cage with mesh uppers and a slip-on construction. Made famous by the Kylie Jenner name, the shoes are not just about style. Exaggerated heels provide stability while pivot points at the heels and toes allow for fast 360 movements and turns. The shoes are available in attractive blue/Icelandic blue and black/Icelandic blue colorways. Lacoste Europa - The Lacoste Europa are smart casual sneakers done tennis-style. The premium monochromatic leather uppers balance nicely with the subtle contrast details and provide a hint of the classy name behind the footwear. A versatile and solid build makes the footwear an essential part of any work and lifestyle wardrobe. Nike Air Max 97 Ultra 17 - The Nike Air Max 97 Ultra 17 sneakers have a defiantly futuristic style that echoes their predecessor’s revolutionary full-length Air unit, a feature that shook the running world when it debuted. Remastered in the newest edition, the knit and mesh fabrics that make up the uppers give these blue sneakers a sleeker and lighter look and feel. 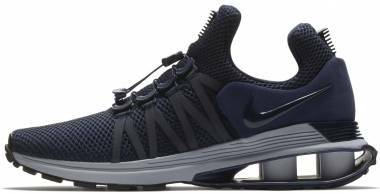 Nike MD Runner 2 LW - These fresh Nike sneakers based on a 90’s runner retains the lightweight feel of the original silhouette but ups the style by covering the uppers with suede overlays and lightweight nylon. Nike SB Air Mask Bruin Vapor - The Air Mask Bruin Vapor shoes place a contemporary look on an otherwise classic profile. The slimmed down, low-to-the-ground AM Bruin Vapor provides an enhanced board feel while Air Max cushioning on the soles ensure you stay comfy as you ride. Nike Air Force 1 UltraForce Mid - Extremely light for mid-top shoes, the Air Force 1 UltraForce Mid sneakers make excellent use of cored out foam midsoles/outsoles to create the lightest Air Force 1 yet. While staying true to their roots, these Air Force 1 iterations also elevate the classic by adding eye-catching reflective accents. Nike SB Stefan Janoski Max Mid - The Janoski Max Mid expertly combines performance, style, and comfort in one. 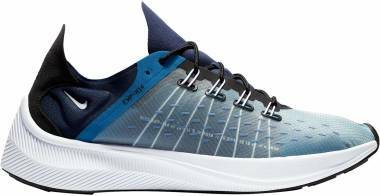 These blue shoes feature deeply-grooved soles to let the foot flex, tweed uppers for better visual appeal, and TPU panels to add water-resistance. Air Jordan Dub Zero - First seen on the scene in 2005, these Air Jordans have tremendous staying power and have managed to keep relevant decades after their debut. These blue sneakers are excellent examples of shoe combinations that work, having taken design inspirations from seven Air Jordan silhouettes from the 4 to the 20. Laser-etched uppers provide added visual appeal. Reebok NPC II - Named the Newport Classic or NPC for short, the original silhouette debuted on the tennis court in the 80’s. Worn by such legends as Boris Becker and John McEnroe, the streamlined silhouette quickly drew attention from sports fans and the street culture set. Returning as the NPC II, the footwear carries the unmistakable identity of the tennis shoe that started it all. Clad in premium leather and accented with attractive stitching details, it’s no surprise these blue sneakers have managed to become a classic. Puma x Sophia Webster Platform Glitter Princess Sneakers - These blue sneakers are made to stand out, from the metallic uppers to translucent and glittery outsoles. British designer Sophia Webster added a riveting platform silhouette with oversized, sparkly laces and eyelets to come out with one-of-a-kind kicks. Patta x Asics Gel-Respector - Dutch streetwear and sneaker store Patta has collaborated with Asics for the fourth time on the Gel-Respector silhouette. 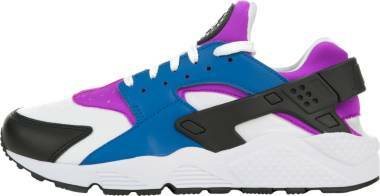 The blue sneakers titled “Anime” draw their inspiration from colorful Japanese animated films and characters. 3M striping underlays, premium suede overlays in methyl blue, and vibrant grey and orange accents all add to create beautiful kicks that draw the eye. Nike Air Max 98 Gundam - In January of 2018, Nike dropped a new colorway for the Air Max 98 called the “Gundam.” Dressed in the blue, red, and white colors of the RX-78-2 in the Gundam sci-fi series, the Air Max 98 model features elasticated laces and toggle pulls, full-length Max Air units, leather uppers, soft nylon paddings, and premium mudguards. Stussy x Nike Air Max 95 - Contemporary clothing brand Stussy, a popular name in the streetwear and hip-hop scene, worked on the Nike Air Max 95 for the silhouette’s 20th anniversary in 2015. Three colorways debuted including a stunning Loyal Blue one with blue-based leather uppers, red accents on the insoles and neoprene tongues, and the famous rib-like lace stays. Palace x Adidas Gazelle Indoor - Streetwear brand Palace gave the Adidas Gazelle an overhaul with their street-ready rendition of the silhouette back in 2017. The shoes’ solid blue construction is perfectly contrasted by the yellow branding stripes and heel accents. Perf toes, black soles, and Palace branding in gold perfectly round up these kicks. Packer Shoes x Adidas EQT Running Support 93 “SL 80” - Blue rules in these superlative kicks designed by Packer Shoes. The Adidas EQT Running Support has been given a makeover SL-80 style. Paying tribute to the iconic Adidas footwear, Packer Shoes dressed the EQT in the eye-popping combination of navy/gold colors of the SL 80 using suede and mesh panels and nylon. C2H4 x Vans Old Skool - The iconic Old Skool sneakers have been deconstructed by C2H4 Los Angeles into beautiful pieces that showcase hand-sewn craftsmanship. Tonal leather laces, denim-pattern overlays in an indigo shade, stripped eyelets, and wood bead lace accents all contribute to create one show-stopping silhouette. Titolo x New Balance 247 “Deep Into The Blue” - These blue sneakers from New Balance and Titolo provide unrivaled support and comfort as well as superior contemporary style. The vibrant blue theme can be seen from heel to toe in premium suede overlays while hits of lavender on the N logo and heel tabs add a touch of flavor and contrast to the sport-inspired silhouette. Fragment Design x Converse One Star (Blue) - In 2016, streetwear godfather Hiroshi Fujiwara gave the Converse One Star the fragment treatment. Hairy suede uppers in dark blue provide a nice backdrop against the white one star logo of the renowned shoe brand while a volt-colored sole adds enhanced visual appeal. Converse x Collette x Club 75 - To celebrate Collette’s 20th anniversary, the Paris shop along with cult brand Club 75 work together on the Converse’s One Star and the All Star 70 to produce shoes inspired by the French flag. While two All Star 70s are bedecked in red or white, the One Star is proudly blue with corresponding tonal laces. Doraemon x Packer Shoes x Atmos x Reebok Instapump Fury - An Asia-only release, these furry blue sneakers are inspired by Japan’s beloved anime character, robotic cat Doraemon. Covered in blue, the shoes also feature pink soles and a yellow pump, a nod to Doraemon’s bell collar. The kicks debuted in March 2017. We know that certain brands are priced higher than others but did you know that there are also particular shoes that for one way or another have become so highly desirable that collectors are willing to pay several hundreds to thousands of dollars for them? 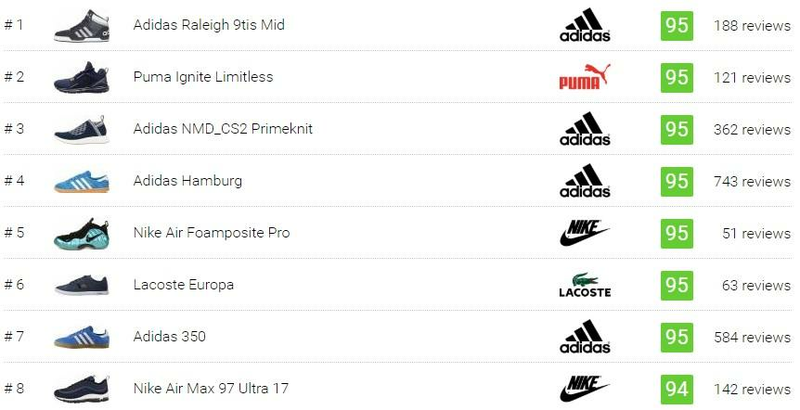 Below is a list of some blue sneakers that command outrageous prices on the market. Nike SB Dunk High Pro - American clothing and skateboarding shop Supreme NYC collaborated with Nike for the second time in 2003 and decided on the SB Dunk High Pro. What came out were three flashy models in white leather and crocodile skin-patterned materials with gold stars on the panels and a lace jewel bearing the name, Supreme. Resale value has gone through the roof with prices going above $1000 and the University Blue colorway commanding the highest tag of all three. Eminem x Air Jordan 4 - Rapper Eminem’s tie-up with the Air Jordan brand in 2005 resulted in a smashing blue shoe with red and black accents. Only 50 pairs were produced, and these were given to friends and family. Stadium Goods carries an unused pair which retails for $70,000 while used ones go for around $27,000 on eBay and other reseller stores. Air Jordan 1 Satin Royal - These 2017 black and blue sneakers released in limited editions in only two stores—one in Atlanta and one in Houston. The highly coveted satin-covered kicks’ exclusivity drove up prices to around $1,600 per pair. 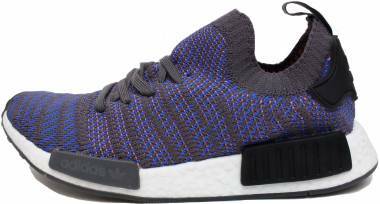 Adidas NMD R1 Blue Camo - 2016’s NMD R1 Blue Camo drop now has a resale value of around $900. Unlike other NMDs, the NMD R1 Blue Camo stayed true to the original design which does not contain overlays or sidewalls. 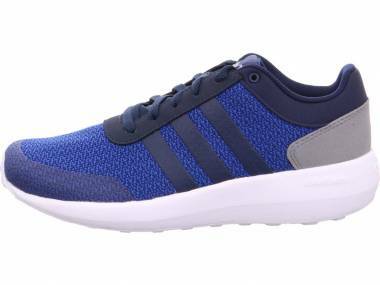 The black and blue sneakers boast of stretchy Primeknit uppers, an integrated lacing system, and the Boost technology. 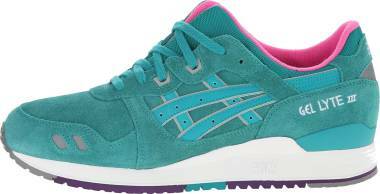 HUF x Asics Gel Lyte III - This 2011 rendition of the Gel Lyte III was inspired by American flag colors. Mainly done in blue, red and white accents also dot the upper. The blue sneakers now have a resale value of over $1,500. 1. Are blue shoes really versatile? What are the ways I can wear them and how? Blue sneakers are very adaptable and are an essential part of any wardrobe. You can wear them in different ways, from casual to smart. It all depends on the cut and the style, and yes, sometimes the lightness or darkness of the shade too. a. Sporty - Think Vans Old Skool, Adidas Matchcourt Mid, Nike Duel Racer, and Puma Fierce Core. 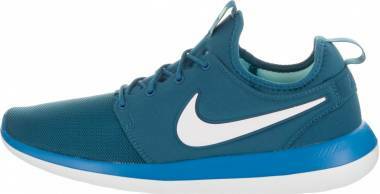 These blue sneakers are perfect for when you want to exude an athletic vibe. Style Guide for Men: Match with joggers and a plain shirt (or use a statement tee when you want a hint of your personality to show through). You can also throw in a hoodie on top. Style Guide for Women: Women can don their sporty kicks and wear them with yoga pants or leggings and a fitted shirt/hoodie. Color: Any blue shade will do, from cool and light to deep tones although metallic hues will really stand out. b. Casual - Hanging out with friends at the bar or going shopping? Try something along the lines of the Adidas Superstar Bounce, Saucony Shadow 5000, Asics Aaron, Reebok Classic Nylon, or the Vans Anaheim Factory Authentic 44 DX. These cool kicks will add pizzazz to your everyday, casual outfits. Style Guide for Men: Wear these blue sneakers with a long-sleeved cotton plaid shirt (roll up the hems) and jeans. Or pair with a button-down cotton polo shirt and some shorts. Style Guide for Women: Match these blue sneakers with anything from shorts to dresses. Women can rock the sneakers with light wash jeans and a white tank or blouse. A long cardigan on top can make the outfit more dressy. Color: Casual occasions don’t demand much regarding color. Wear any shade of blue that you want as long as you properly coordinate it with the rest of your outfit. c. Smart - Want to make a great impression on a first date? Need to attend a semi-formal party? No problem. You can still wear your blue sneakers. The Adidas Intack SPZL, Adidas Mallison SPZL, Nike SB Zoom Stefan Janoski Canvas, Polo Ralph Lauren Halford are just some examples of versatile pieces you can wear for smarter settings. Style Guide for Men:Chinos are perfect when you want to achieve a smart casual style because it’s both relaxed and polished. Take your blue sneakers and pair them with dark chinos (navy looks good), a crisp white button-up shirt, and a denim jacket. Remove the denim jacket and replace with a blazer for a dressier vibe. Style Guide for Women:Sneakers and dresses actually look good together. Try matching your blue sneakers with a skater dress and a cropped jacket. Shift and A-line dresses also look extremely nice when paired with sneakers. Color: Usually, more formal occasions require darker shades of footwear. However, if you feel you can pull it off, and there are many instances where light blue sneakers would fit the bill, then go ahead and strut your light-hued shoes. 2. Does a footwear's color signify something? Quite a significant number of psychology research on color demonstrate that each shade evokes certain physical, emotional, and behavioral responses. The blue, for instance, is generally supposed to portray calm and passivity and tends to attract introverts. However, there are so many shades of blue that some tones actually project an image of energy instead of quiet. Mostly it conveys dependability, trust, and loyalty. It’s a good color choice when you want to communicate authority or exude power. When it comes to footwear, light blue shades usually denote a relaxed vibe. People use warm and dark shades of blue for work or formal affairs, while during sporty occasions people usually pick really bright shades of the sapphire color. 3. How do I clean my blue shoes? Cleaning and caring for blue sneakers is no different than with other footwear. Just don’t use bleach ever, and these same rules go with all other color shoes too. Here are some tips on how to clean your kicks. Material - Leather: Gently brush off any dirt from your shoes. Wet a piece of cloth in mild soap and cold water and use this to wipe off any remaining dirt. Make sure not to soak your shoes in water. Material - Suede or Nubuck: Use a brush specifically made for cleaning suede since suede has a soft grain that you would need to care for. Make sure to do this when your blue sneakers are dry as suede is sensitive to water and brush only in one direction. Stubborn scuffs can sometimes be cleaned off by rubbing them with a piece of pencil eraser. Material - Man-made leather: A soft cloth or bristle brush can be used for synthetic leather footwear. You can use soap and cold water for cleaning your synthetic blue sneakers. Material - Canvas or Nylon: Some canvas shoes can be thrown into the wash although this is not generally recommended. You can, however, clean them quite easily by brushing with soap and cold water and then rinsing them off. 4. How can I make my casual blue kicks last? Make sure to clean off your lifestyle shoes as soon as you get home especially if they’ve been through mud or have been stained. You should thoroughly dry off your blue sneakers before putting them away for storage. Improperly dried shoes can cause rot to set in. Give your shoes a bit of rest. Try alternating footwear instead of using the same shoes day after day. This gives them time to completely dry out from sweat (if you don’t wear socks). Try putting some baking soda in your shoe wardrobe to draw out all moisture completely and keep your blue sneakers smelling fresh. If you have any footwear made of suede, spray a coat of suede protector on them to prevent stains and marks. 5. Can you name blue sneakers that figured in the movies? 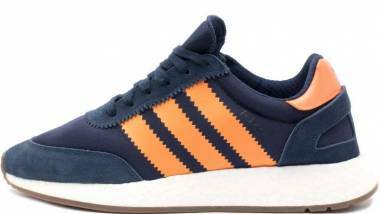 Adidas Dragon - Famously won by actor Paul Michael Glaser who played David Starsky in the movie Starsky and Hutch. Nike Internationalist - Worn by fictional character Brian Johnson in The Breakfast Club. Vans Authentic - Worn by Seth (Jonah Hill) in 2007’s Superbad.